Increase your stability; this in turn reduces fatigue. Reduce the strain on your legs, particularly the knees. However, always seek medical advice if you are experiencing discomfort in the knee. Where can trekking poles be used? Trekking poles work best on good open tracks. They can be used on more difficult terrain, but the basic technique may need to be modified. Trekking poles are recommended for use on the Bibbulmun Track and the Cape to Cape Track. Trekking poles should not be used when use of the hands is required. i.e. when following a compass course or when scrambling up steep rock. Trekking poles are not recommended for use on the Stirling Ridge Walk. Always buy trekking poles in pairs. One pole just doesn't work and you may not be able to get a matching pole in the future. Also some manufacturers produce right and left handed poles. Expect to pay $120 to $150 for a reasonable set of aluminium poles. Carbon fibre poles are available, but cost well over $200. Trekking Poles - How useful are they? When used correctly, trekking poles enable the bushwalker to travel farther and faster, with less fatigue. They do this by putting the arms to work, taking some of the load off the legs. Before we go any further let’s take a quick look at the way we walk. Take a walk down your garden path. Now swing your arms vigorously in time with your legs (i.e. left leg and right arm forward, then right arm and left leg forward etc.) You should find that this helps your legs to take larger strides. You'll also notice that your stability increases. Your arms counter-balance your legs making you steadier on your feet. If we repeat the exercise, but this time use trekking poles to push ourselves forward, like a cross country skier, then you’ll very quickly run out of garden path. Trekking poles are light weight extendable walking poles. They are used in pairs' so they more closely resemble ski poles than the traditional walking staff. In-fact their true origin lies in Nordic Walking, a technique devised in Finland to help train cross country skiers during the summer months. The typical trekking pole comes in three tubular telescopic sections that collapse into each other. The bottom two sections have locking devices that lock each section in position, so the overall length of the pole can be adjusted. The top of the pole has a handle with a wrist strap, and the bottom has a tungsten carbide tip and a detachable basket that prevents the pole from sinking into soft ground. More about trekking poles goes into the parts of the poles in more detail. Meanwhile let’s go back to the garden path and give our poles a work out. The adjacent picture shows the correct method of holding the pole. 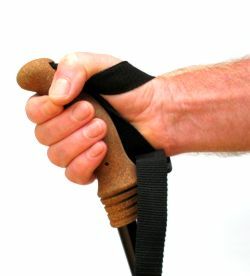 Insert the hand through the loosely hanging wrist-strap, and then bring the thumb back over the top of the strap. Curve the fingers around the handle to meet the thumb. Adjust the strap so it fits snug around the heel of your hand. Hold the handle loosely and exert a downward force on the pole by pushing down on the wrist-strap. Poles are fully collapsed when stowed in your rucksack, so before they can be brought into use, they must be extended to the correct length. The best way to do this is to follow the manufacturer’s instructions. Usually the lower section is opened up to a pre-set mark and final adjustment is made on the upper section. You should end up with both sections extended to between half and three quarters of their full length. The elbow forms a right angle when the pole is held vertically. Stand on level ground with your shoulders square. Hold one pole vertically with the tip of the pole resting on the ground in front of you. Adjust the height of the pole so that the elbow is at a right angle, as shown in the picture opposite. Use this pole as a guide to set the length of the other pole. Important: never extend any section of the pole outside of the manufacturers recommended specification. This is usually marked, on each section, with a red circle. Hold the pole loosely in the hand as above and start walking. Keep the tip of the poles behind your body and swing your arms as in the earlier walking exercise. As the left leg comes forward, swing the right arm forward. Simultaneously plant the left foot and right pole; exert pressure on the wrist strap so the pole pushes you forward. The right leg now comes forward together with the left arm. Simultaneously plant the right foot and left pole; again, exert pressure on the wrist strap so the pole pushes you forward. Continue swinging the arms and poles in time with the legs. The more aggressively you push on the poles the faster you go, but remember that you will tire more quickly. Astute walkers save their energy for the uphill sections. When going uphill you will find that you need to bring the poles forward as the incline steepens. However, the tip of the poles should still be behind your body. When going downhill you exert less pressure on the poles, to the point where they act only to steady you. On steeper descents you can use the poles as a brake. In this case the tips of the poles are brought forward of the body. You will probably find that you break time with your legs (my short legs need to go twice as fast as my arms to keep up). Adjust your grip on the poles so that you hold them with just the thumb and forefinger forming an “o” around the handle. This allows the poles to pivot freely. Don't be afraid to lean forward and push on the poles. As you become practiced with the use of your poles you may find that some fine adjustment to the length is necessary. If you keep tripping over them, increase the length slightly. Shorten the poles when ascending steep hills. It will soon become obvious that you really do need two poles. The technique will not work if you are hobbling along on one pole. The basic technique described above works well on open and undulating terrain, but is no use for ascending steep rocky steps. In this case use the poles as you would the traditional walking staff. Plant the left foot and left pole forward. The right pole is behind you with the right foot. Push yourself up using the left foot and left pole and use the right pole to steady yourself, as the right foot is brought forward. Bring the right pole forward. How you proceed from here depends on whether you continue to lead with one foot (best foot forward) or alternate your steps. 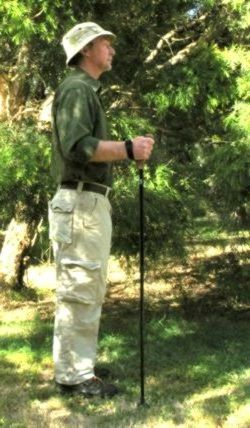 Trekking poles are good for crossing creeks and fallen tree trunks. You can also use your poles for balance when crossing rough rocky terrain, but remove your hands from the wrist straps so that you can easily let go if the pole becomes jammed in a rock crevice. There are other techniques for using the poles on rough terrain, including some spectacular techniques for descending at speed, but we'll leave those for a more advanced discussion. When to stow the poles. Trekking poles are most effective on open terrain and can become a hindrance when used in thick bush. When you need to follow a compass course with any degree of accuracy; stow the poles to free your hands. You will also need your hands when clambering up steep rock; stow the poles in your rucksack.